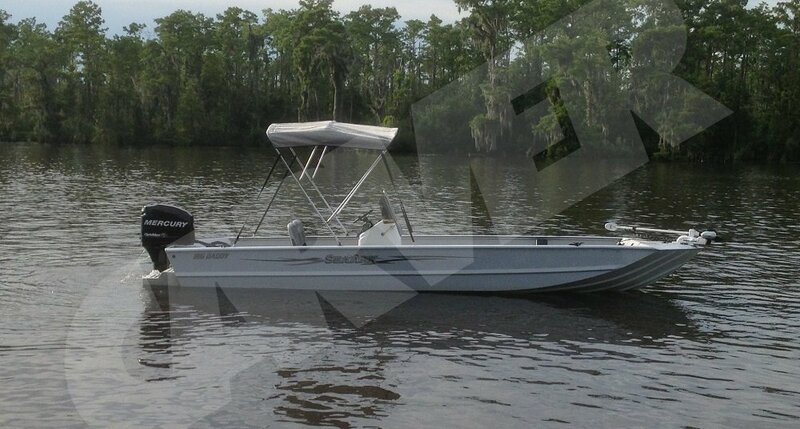 I'm thinking of a bimini top for my 14/48 jon ,from the floor it's 13 inches to the top of side . I would like to be able to stand up straight but that would mean 60 inch bimini ,how important is it to be able to stand up straight ?? My current boat is much larger then yours @ 18'6" and I have my top set at 6' so I can walk freely under it. I'd say it's pretty important to not have to hunch over. As long as your top can be adjusted so why not make it most comfortable for yourself? Keep in mind though, that as the sun rises/sets you'll get more sun on you depending on what direction your headed, but you can always drape a towel or small trap over the side while fishing to block the sun if needed. how important is it to be able to stand up straight ?? comes down to personal choice of function vs form. I have had a Bimini only one time and I could walk under it, which made it comfortable. It was on a CC 22' glass offshore fisherman and loved it. So if it was my boat, I would go for the "walk under" size. the bucks on one that you may not be satisfied with. google it: how to measure a bimini top. Your fellow TinBoaters are absolutely correct! 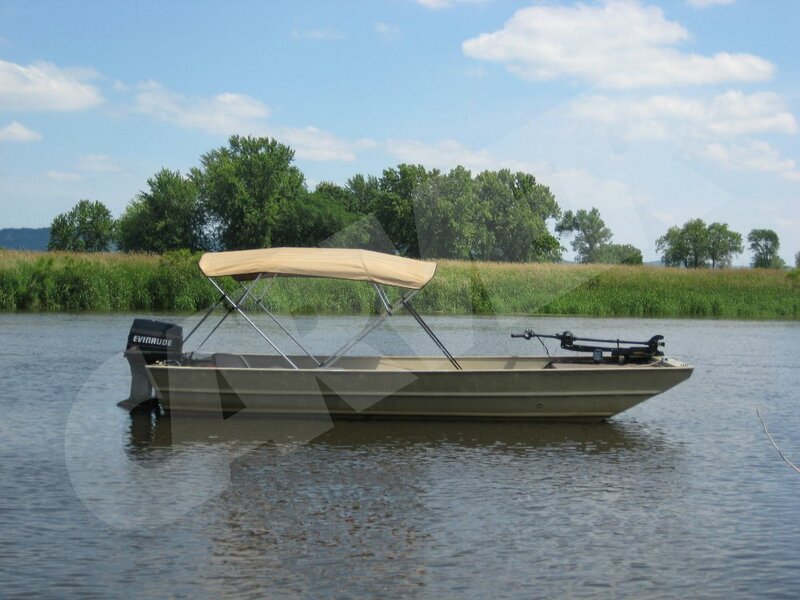 The height of a Bimini top is all a preference and whatever makes you the most comfortable while on the water. We recommend taking a measurement from the mounting point up, in a straight imaginary line, while standing in your boat to see exactly what size will work best for you! If you're in the market for a new, USA made Bimini top, we offer an additional 10% discount off the online prices for being a TinBoats member, so be sure to mention that in the comment section at checkout or simply place your order with a representative. Let me know if you should have any other questions and I'm happy to help! I've had bimini tops on my last three jons, some of the best money you can spend if you live in a hot climate. I'm 6'2", not sure I could stand straight under any of them. However, I like a shorter top (think two beam) that takes up less overall length on the boat. Also, unless it's right around noon, the sun will be at an angle and the higher top won't be as effective (hold an umbrella 6' over your head and then 2' and see what blocks out more sun). I guess I like them on the shorter side over the stern bench. How do you handle rods with the bimini tops. I troll for crappie year round and it looks like the support poles would always be in my way? Any first hand experience from trollers??? I troll for trout/kokanee using down riggers and the bimini top can get in the way. Most problematic is when landing/netting a fish because there is a limited space to move the rod around. I could get around this by standing on the rear seat of my 15' Klamath, but I prefer not to do this because I'm not as sure footed as I used to be. There is an easy fix, at least I find it easy. When fishing with a partner, one of us will unsnap the rear strap and let the bimini fall forward. If I'm by myself, I will typically only connect one of the rear straps. When I get one on (of decent size) I will do the same thing -- quickly unsnap the rear snap and let the top fall forward. Of course, this is just my experience. Thanks for the info, it seems like the bimini is nice to have but a pain as well. JMO. I don't have a bimini for my Lowe yet, but I had one with my old Hobie Power Skiff. It was short and I couldn't stand up all the way while under power (it was a center console and I stand while driving) so that was a pain in the back to hunch over. But once I sat down in the front seat, I was completely covered and the sun couldn't get in at an angle. If I was going to run for more than 5 minutes, I would put it down while under way so I could stand up, I have a bad back already. 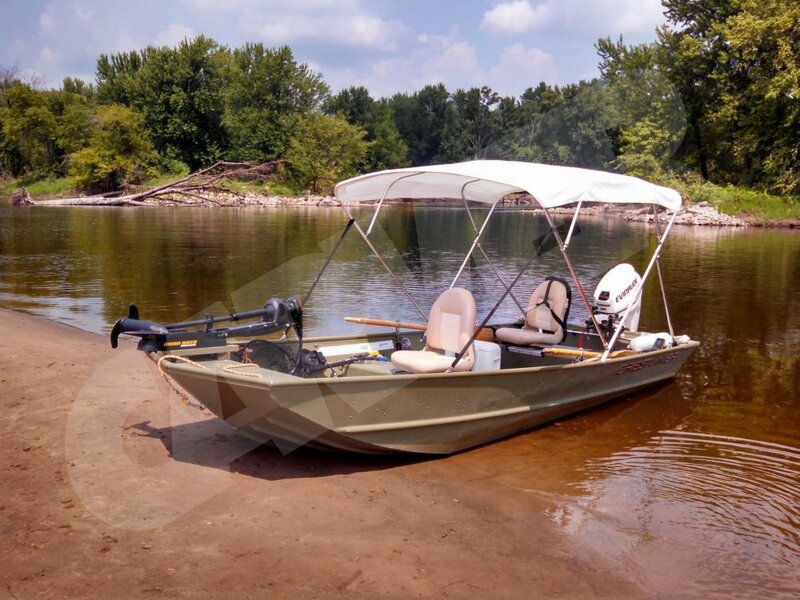 I keep thinking about getting one for my Lowe, but with the console forward, I usually sit in a beach chair up on the front platform so it would need to be a forward bimini and with the platform raised, it would be less room up there, but more in the back where I stand to drive. I would just need to remember to duck when stepping up to the raised deck. But for the sun protection, a bimini is well worth it. Yep, they can get in the way, but I think the benefits out weigh the bad points. Even though they are open sided, they do provide a lot of shade. Also nice to have on rainy days. When I first got the boat, the bimini was usually leaning against the side of the house. Now days, even though I don't always use it, I never take it off the boat. Folded down it actually makes a nice back rest for someone sitting on the forward raised deck - hahah.